Ten Years - The Cameron Print Project. Ten Years: The Cameron Print Project offers 29 works of art produced over the past decade in a series of annual collaborations between visiting artists and printmaking students at the College. 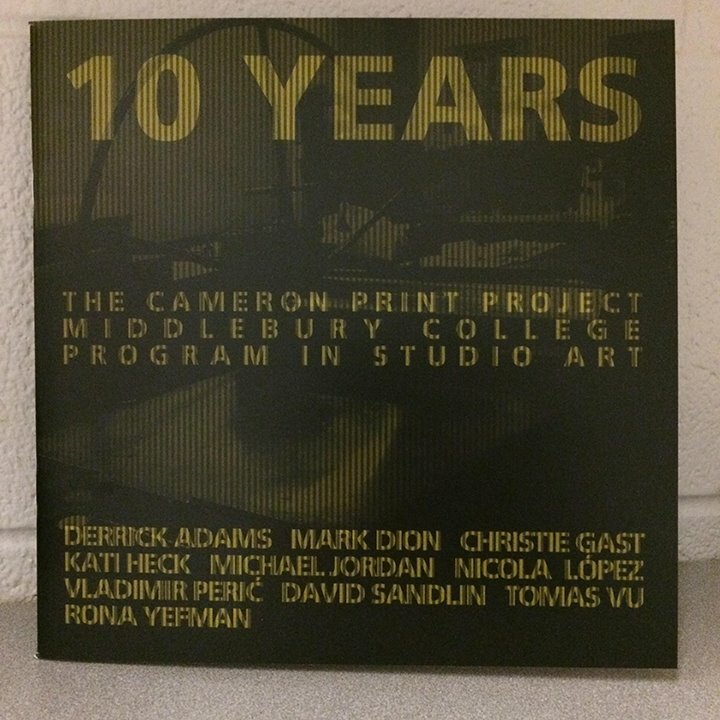 Through an innovative program established by Dort Cameron III and Elizabeth C. Cameron, Middlebury Class of 1967, the Cameron Family Arts Enrichment Fund has enabled the Studio Art Program at the College to host week-long artist residencies every year since 2008. Ten artists have so far worked alongside some 140 students in this endeavor. Among the artists who have visited, some are well known and established, like Mark Dion, Derrick Adams, and Tomas Vu; others are at earlier stages of their careers. This visionary project has offered Middlebury undergraduate art students an opportunity for professional growth as well as the invaluable experience of engaging in the making of a finished work of art from concept to completion. Involved at every stage of the process, the students participated directly in the planning and development of an edition of original prints. They benefited from purposeful, close-range working conversations with each of the visiting artists. The artists made a gift of the works completed at Middlebury to the College museum. Since the prints are multiples, in editions of 25 to 50 impressions, each of the students and staff who were involved in making them has also been given one of the works he or she helped to produce. Representing a range of silkscreen and intaglio techniques, the images are varied in size and content as well as material. Laser cut leather and contact paper are among the somewhat unusual elements that some of the prints employ. Some images contain hand-colored collages that have been pasted to the surface of the print. Among the etching techniques represented are drypoint, spit bite, and aquatint, and a number of the works incorporate texts—some with provocative messages. The Cameron Print Project, under the auspices of the Program in Studio Art, has been overseen by Fletcher Professor of the Arts Hedya Klein. As a consequence of this experience, she has observed, the work of the students in her silkscreen and intaglio classes has grown substantially in both artistic vision and technical ambition. The exhibition is accompanied by an illustrated catalog with brief biographies of the participating artists, who represent a variety of countries in the global art world of the present time. 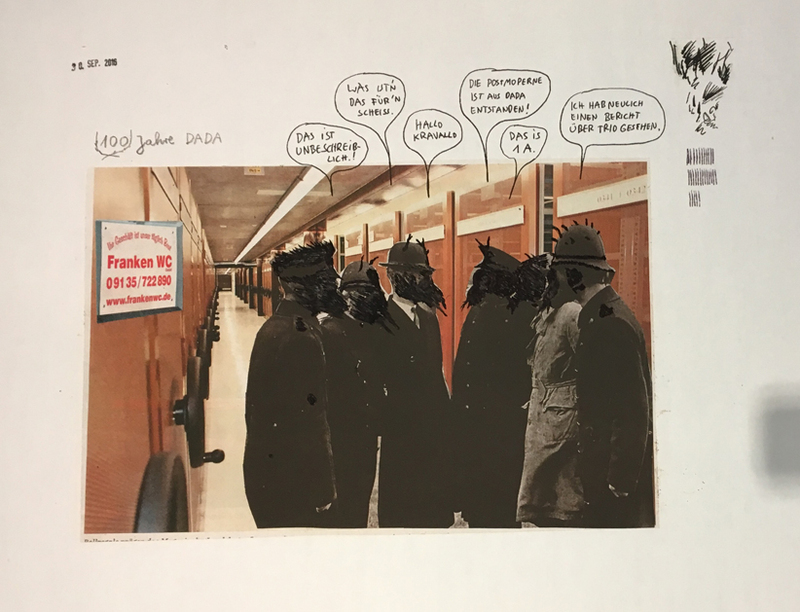 Julian Kreimer, artist, critic, and Associate Professor at State University of New York at Purchase and a frequent contributor to Art in America, among other publications, has also contributed a statement to the publication. Die Seite befindet sich gerade im Umbau. Ich bitte um Verständnis, dass einige links und Verknüpfungen haken.